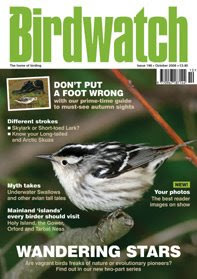 Stories from the Birdwatch Newsdesk are now being posted direct to www.birdwatch.co.uk, the relaunched website of the magazine - please bookmark it in your browser and be sure to visit it regularly for news and reviews, features and much, much more. This blog will remain online for the time being as an archive of news stories published since June 2007. Want to guarantee your copy of Birdwatch and receive it early? Email subscriptions@birdwatch.co.uk for details.